​Calvary Baptist Church is a small country church with a loving, welcoming spirit. We love our Lord and Savior and firmly believe in the inerrancy of the Holy Bible as well as the power of prayer. Our church was established in 1912 and has been serving God in Orange county for over 100 years. We are a Southern Baptist church and are aligned with the SBCV. Our primary focus is ministering to our local community. We have Sunday School and Worship Services on Sunday mornings. We have several activities on Wednesday evenings which include a Fellowship Dinner followed by a Study and Singing time for our youth we call KidzPraze, and a Bible Study and Prayer time for adults. We would love to have you come and worship with us. We would be honored to have you join us for any of our services. ​That there is only one true and living God, revealed to us as the Father, the Son, and the Holy Spirit; who are co-equal and the eternal manifestation of the true and living God. ​Jesus Christ is the Son of God. He is co-equal with the Father. Jesus lived a sinless human life and offered Himself as the perfect sacrifice for the sins of all people by dying on a cross. He arose from the dead after three days to demonstrate His power over sin and death. He ascended to Heaven's glory and will return again someday to earth to reign as King of Kings, and Lord of Lords. ​The Holy Spirit is co-equal with the Father and the Son of God. He is present in the world to make us aware of our need for Jesus Christ. He also lives in every Christian from the moment of salvation. He provides the Christian with power for living, understanding of spiritual truth, and guidance in doing what is right. He gives every believer a spiritual gift when they are saved. As Christians, we seek to live under His control daily. ​We believe that God revealed the Bible to men, that the scripture is all sufficient rule of Faith. It was written by human authors, under the supernatural guidance of the Holy Spirit. It is the supreme source of truth for Christian beliefs and living. Because it is inspired by God, it is the truth without any mixture of error. (Genesis 1:27; Psalm 8:3-6; Isaiah 53:6a; Romans 3:23; Isaiah 59:1, 2 1 Corinthians 15:22). Salvation is God's free gift to us but we must accept it. it is not God's will that any should perish, but that all should come to salvation through Jesus Christ. We can never make up for our sin by self-improvement or good works. Only by trusting in Jesus Christ as God's offer of forgiveness can anyone be saved from sin's penalty. When we turn from our self-ruled life and turn to Jesus in faith we are saved. Eternal life begins the moment one receives Jesus Christ into his life by faith. ​ That the Lord's Supper is to commemorate the death of Christ until He comes again, and is open to ALL believers. Evangelism: we will make effort to spread the gospel. Discipleship: that we will study and teach the Bible and the gospel of Jesus Christ. Fellowship: setting aside time for us to enjoy being together. Ministry: that we will strive to serve everyone in needs both spiritually and physically. ​That the Christian ministry is a divinely appointed means for the spread of the gospel through the world and that it is the responsibility of all Christians, according to their ability, to contribute and assist to its support. 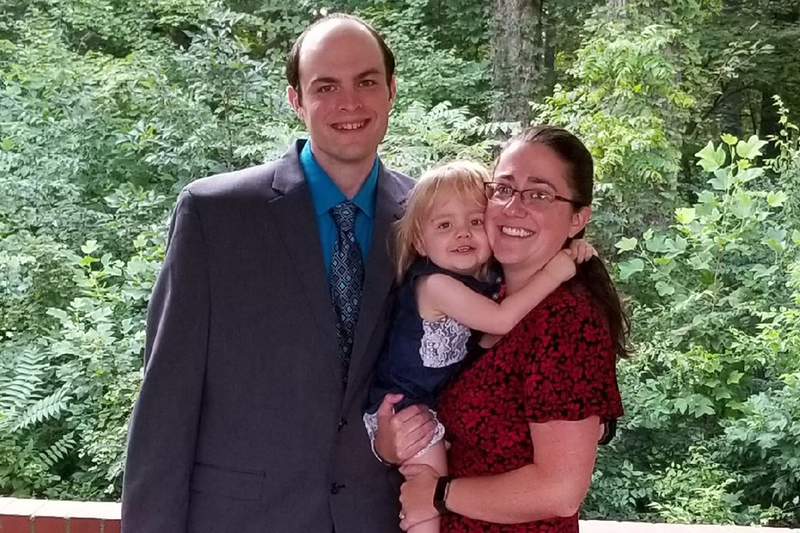 Pastor Kristopher B. Cook became our pastor on September 1, 2018. He began his pastoral service in 2008 with various children’s and youth ministry activities and became the Youth/Assistant Pastor at Worsham Baptist Church in Farmville in 2012. In 2015 he became the Senior Pastor at First Baptist Church Millstone in Nathalie, VA. Brother Kris earned his Bachelor of Science degree from Longwood University in 2012. He also received a Master of Divinity in Pastoral Ministries in 2016 from Liberty University Baptist Theological Seminary. Pastor Cook, his wife Ashley and daughter Lillian reside in the parsonage next to the church. Please join us in welcoming the Cooks to our community. May 19, 1912 “several brethren” met at the Conway School House, sometimes known as the Ranch School, to organize a Baptist church. Rev. M. G. Leaman was chosen chairman and Mr. L. R. Collins, secretary. On this date a motion was made and carried that such a church be organized and named Calvary Baptist Church of Orange, Virginia.